The #MeToo movement is about women raising their voices together, to demonstrate the sheer magnitude of women who have been sexually harassed or sexually assaulted. It is a rare moment in history where many women, who have been frightened into silence for so long, are shouting out about their treatment. 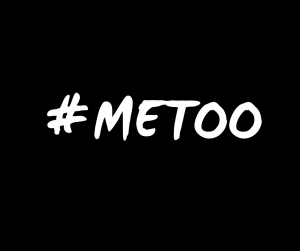 #MeToo has taught us that women will stay in situations where they are uncomfortable, and endure men violating their bodies, because they are terrified. It has also shown us that women are sometimes so disconnected from what they feel, and often too powerless to speak their truth, that they do nothing in situations where their human rights are violated. In situations where women feel that things are not right, and sense that bad things might be about to happen to them, they sometimes do nothing, because the training they have received their whole life kicks in. Girls are taught from a very young age to not hurt anyone else’s feelings. In particular they are taught not to hurt the feelings of boys and men. I studied childcare back in the 1990s. One day while on field experience at a childcare centre I witnessed this: a little girl, around 3 years of age, approached and hugged a little boy. The little boy pushed the girl away. A daycare worker intervened and told the little girl that we don’t hug people when they don’t want to be hugged, and asked her to give the little boy some space. Then, a little later that day, a little boy went up and hugged a little girl. The little girl pushed the little boy away. The same daycare worker came up to the little girl and admonished her for pushing the little boy away, saying he was just trying to be kind and caring and she should give him a hug. It was so clear what those children were learning. Boys have a right to their personal space, and girls must listen when boys demand it. Boys also have the right to encroach on a girls’ personal space, and girls should allow this, whether they want it or not. Girls’ are taught to swallow their resistance. We do this to girls all the time. We tell them in so many ways that they should ignore their feelings so that they don’t hurt a boy’s feelings. We tell them they should ignore their feelings so that they don’t make waves. One key way we are still doing this is in the forced requirement that girls wear skirts and dresses to schools. Many girls do not like wearing skirts and dresses, and have asked over many, many years to be allowed to wear shorts and pants to school. And they have been told no. They have been told to ignore their discomfort and keep dressing the way they are told to, because they look prettier in dresses, the principal likes it, and it’s traditional. How long are we going to tell girls to ignore what they feel and do what they are told, even when doing what they are told leads to their distress? Why are we surprised, and often angry with young girls, when they ignore their own feelings and don’t stand up for themselves? The very schools they go to tell them to ignore their own needs in something as basic as what they wear. We educate them in institutions that tell them to put up and shut up. We are violating the basic human rights of girls every day when we force them to wear skirts and dresses. It is not the wearing of the skirt or dress that is the problem. It is the requirement that they wear it. The fact that they are not given any other choice, and are in fact threatened with detention if they do honour their distress, or simply exercise their right of choice, and put on a pair of pants or shorts. In asking for what they want, girls step outside the expectation that they should care more about the needs of others. They show up for themselves, and for other girls. They demonstrate courage, honesty, initiative and advocacy – all those things schools tell us they wish to foster in girls. The almighty backlash from schools in the refusal to allow girls to wear shorts and pants however, shows just how far we still have to go.